Christmas is not about presents. It's about presence. The hustle and bustle of shopping, looking for the perfect gift, attending parties, and decorating is supposed to bring joy. And you can choose for it to do exactly that. Simply stop seeing it all as a pain in the you-know-what! Start looking at it for what it really is. And be OK with simplifying. It's a choice. Indeed Christmas is a Christian celebration - in fact, a birthday party! I have chosen to use Christmas as a time to celebrate life and love. Being with your loved ones... REALLY being with them... will have long lasting effects and will be remembered much more than that box of chocolates (although, I really love chocolate) or even the latest version of the iPhone. Sit down for a cup of tea and a good chat. Listen. Laugh. Reminisce. Celebrate! This time of year brings sadness to many, too. Do something to make the season for those people more manageable. People want to be surrounded by love. Your employees, team members, or colleagues are no different - they are human too. 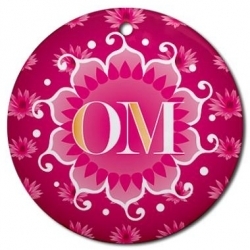 This Christmas, I challenge you to bring OM to your organization or team. Bring awareness of the meaning of Christmas - whatever that is for you and your team. Instead of getting caught up in the Kriskringle gift exchange, get caught up with bringing presents to those in need or presence to each other. That doesn't mean don't have a gift exchange. It simply means, be conscious of what it all means. Your team will remember the calm you gave them. Namaste and thank-you for reading! 2013 will be a great year!